Summary: Ms. Erickson served as the Project Manager and Principal Engineer for this highly unique project and was responsible for the formulation of the State’s first adopted and implemented Inlet Management Plan at St. Lucie Inlet. The plan was adopted by the State of Florida in September 1995, making this the first such plan to be adopted by the state. 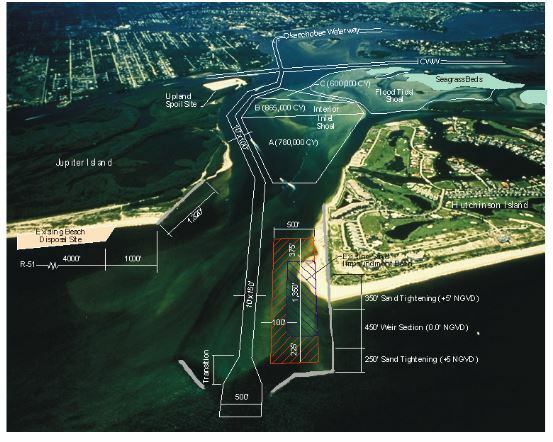 The Inlet Management Plan development focused on an optimization of alternate improvement measures in order to reinstate sand transfer across the inlet onto Jupiter Island, to mitigate for historic deficits in sand transfer and to reduce sand shoaling within the inlet and estuary. Challenges: Working with Martin County on a USACE sponsored inlet to significantly modify the inlet channel, north jetty and impoundment basins and the downdrift sand placement locations for a first-of-its kind project.